When comfort matters most, choose the Catalina chaise lounge. 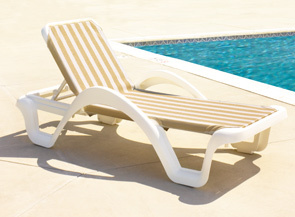 Specifically made for commercial use these chaise lounges set a new standard for comfort and structural integrity - equally stable on a sandy beach as on hard surfaces. The Catalina brings the comfort of your home, away from home. Solid one-piece molded frame construction with safety guards prevent pinched fingers and recessed wheels for easy mobility. "Memory" sling by elastic cordage for excellent recovery and shape retention. Easy to replace colorfast Sanitized® mesh mildew resistant sling fabric wont hold water. It is naturally impervious to salt air and most stains. Stacks easily for storage and will stay cool in the hot sun. 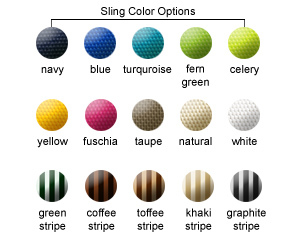 Available in color options as shown. Breathable Vinyl Coated Polyester Fabric.